Shortly following the Aurora tragedy, a non-gun-owner friend of mine, obviously upset, began to question me about why I supported ownership of ‘deadly assault weapons.’ Even as he continued his extended, impassioned diatribe, I could tell that he was yet another victim of the media’s ‘assault weapon’ disinformation campaign. Amazing enough, he had stumbled upon the truth without even realizing it, or at least ‘a’ truth. As Wikipedia so aptly states, the term ‘assault weapon’ is not a technical term describing an actual type of firearm but rather a political term denoting whatever firearm the anti-gun crowd wishes to demonize, regulate, and ban at a given point in time. In fact, the assault weapons ban will have no significant effect either on the crime rate or on personal security. Nonetheless, it is a good idea … Given the frontier history and individualist ideology of the United States, however, this will not come easily. It certainly cannot be done radically. It will probably take one, maybe two generations. It might be 50 years before the United States gets to where Britain is today. Passing a law like the assault weapons ban is a symbolic — purely symbolic — move in that direction. Its only real justification is not to reduce crime but to desensitize the public to the regulation of weapons in preparation for their ultimate confiscation. Should it be renewed, the ban’s effects on gun violence are likely to be small at best and perhaps too small for reliable measurement. AWs were rarely used in gun crimes even before the ban. But facts have little to do with politics at the best of times and those who oppose gun rights for citizens have used the Aurora attack as a springboard to launch new attacks on ‘assault weapons’, whatever they might be at the moment. So as these new ‘debates’ rage on … the next time you hear someone talking about ‘assault weapons’, tell them they simply don’t exist and challenge them to prove otherwise. They might just learn something even if they won’t admit it. This entry was posted in 'Assault Weapons', California, Gun Control, Illinois, Media Views on The Second Amendment, Myths & Misconceptions, National Politics, New York. Bookmark the permalink. One need look no further to find the Great American Conspiracy – demonize guns. It is the psychological attack in the battle for control over the minds of our people and incorporates tried and true methodology – including a lie told often enough…………well you know the rest. Our best weapon is truth/facts, but we must not be silent warriors – we must raise our voices in a cacophony of sound to be heard across this land. Education, publication, speaking out before our legislative bodies, writing letters to the editors and yes, engaging in conversation with your friends and neighbors on this subject. Well written article. Concise and informative. I need to distribute copies to my non-gun owner friends. Please re-post this from time to time. The fact is that legally owned machine guns have not been involved in any crime except one since 1934. That crime was by a police officer. With a lawless government as we have now the ownership of weapons as good as a infantryman should be required. If not what good is the 2nd amendment if it is not to stop tryanny? What about the north hollywood shootout? Those were automatic weapons, if I remember correctly. They were. And that is my point. Those were automatic weapons but they were NOT the subject of the so-called ‘assault weapons ban’. THAT particular piece of legislation addressed semi-auto firearms with arbitrary cosmetic features. Anyway we can share this on Facebook? Click on the Like button at the top of the article and you can share from there. Thanks! Imagine that street racing became a problem. High powered cars with modified suspensions, exhaust systems, racing tires and racing stripes are mowing down innocent drivers and pedestrians. If cars with those characteristics are banned from the streets does the ban include a stock Yugo with racing stripes? It is against the law to yell “fire” in a crowded theater. Yet using the term “assault weapon” is much the same thing – it induces panic solely for that purpose, hoping that thereby our rights will be trampled. To abuse of one right (1st Amendment) to harm another right (2nd Amendment) should be repugnant to all freedom loving people. Actually it is NOT against the law to yell “FIRE” in a crowded theatre, it is only illegal if there is no fire. What is against the law is inciting panic. That is true – I should have made that point clear. Of course these attempts to ban or restrict various types of firearm have nothing to do with reducing crime but they have everything to do with the imposition of social control. Witness the successive bans on semi automatic rifles & then handguns here in the UK, both of which were followed by a rise in crime where firearms played a part. Note also that Derrick Bird managed to kill the same number of people as Holmes did in Aurora, using a bolt action .22 rimfire & a shotgun of the type used for pigeons & pheasants. Nor did the tight restrictions on amounts of ammunition he could possess lessen the severity of his crime. In New York State, the police have no duty to provide police protection to any particular individual. The Courts in New York have held that “generally, a municipality may not be held liable for the failure to provide police protection because the duty to provide such protection is owed to the public at large, rather than to any particular individual” (Conde v. City of New York, 24 AD3d 595, 596 ; see Cuffy v. City of New York, 69 NY2d 255, 260 ). As the Chair of the Public Safety Committee of Manhattan Community Board 12. I will be holding a Public Hearing in September 2012 on NYS Senate Bill S1427 & S1863 with an emphasis on self-defense education & firearm training for women. Bill S1863 PURPOSE: This legislation would remove a gun licensing officer’s ability to deny or restrict the issuance of licenses to law abiding citizens who have successfully undergone the state’s strict application process and appropriate New York State and Federal Bureau of Investigations fingerprint background check required under law. In addition, this bill will conform New York State law to current ATF requirements regarding background checks for firearms transfers. September 12, 2012 at 6:30 PM at Isabella, 515 Audubon Avenue New York, NY 10040. If you live in New York State feel free to take a look at the information that I will be presenting as well as sign my on-line petition included at the link below. I hope that you will come out and support me as I support you. Fraternally. Couldn’t you have just handed him a mirror and left it at that? my utter thanks for a well written article explaining the myth, bed time story, tale, nursery rhyme, fable and lie of “gun control”. What really burns me is why “gun control” is continued to be promoted. A lie can only be told long enough until the recipients act upon it. 1968 is long enough. If elections are used as a graph, I’d have to acknowledge the fact we have abused ourselves into believing we have gained what we lost in 1968. And that is Our Freedom. Sadly, an election will doing nothing, what a mass gathering of law abiding citzens would and can do. How about for once we garner the courage and amass a said gathering of Patriots ? Pick one large city, and show our numbers. Unarmed, of course. It would be the Revolution this country needed, not a tired election. I was at the range a couple weekends ago with my Ruger 10/22 and in the stand next to me was a fellow with his M&P 15-22. Both are 22 caliber rifles, yet one simply looks more tactical. I have been trying to convince a friend to not buy the M&P, and go with the Ruger. I quote: “Buying the M&P is like stuffing your underwear with a pair of socks. 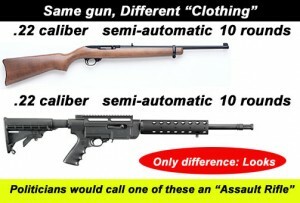 It looks great until you get naked.” Spot on with your point – mechanically and functionally, they are the exact same gun. One looks like a tactical weapon, the other a traditional hunting rifle.